Simply enter the number of tickets you would like for each event on the form to the right and click "Add Tickets to Cart & Proceed". A window will open, at which time you will provide your payment information and confirm your purchase. Ticket orders are NOT shipped. All ticket orders will be available for pickup at the ticket table during contestant registration on Friday night and Saturday morning, as well as prior to the shows on Saturday night and Sunday afternoon. To pick up the tickets, you must simply come to the ticket table and provide the printed invoice you received via email after your ticket purchase. This 90-minute rehearsal pass is for families and friends to watch their contestant prepare for the pageant finals. On Sunday of pageant weekend, this rehearsal pass will allow individuals to enter the venue and watch the contestant rehearsal from 9:30am to 11:00am. Seating will be in the first rows of venue's balcony (where available) or in the rear seating of the venue. The General Admission Section is approximately the rear 75% of the venue. The seating inside this section is open, as individual seats are not assigned. General Admission Tickets are available online, during contestant registration on Friday evening and Saturday morning, following the Saturday morning briefing session, as well as immediately prior to the shows on Saturday night or Sunday afternoon. 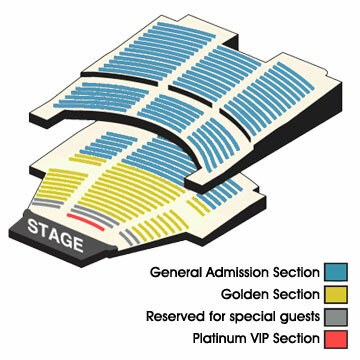 The Golden Seating Section is approximately the front 25% of the venue. The seating inside this section is open, as individual seats are not assigned. These Golden Section Tickets are available online, during contestant registration on Friday evening and Saturday morning, and following the Saturday morning briefing session if available. Golden Section Tickets must be purchased in advance as they WILL NOT be sold immediately prior to the shows on Saturday night or Sunday afternoon. The Platinum VIP Section is exclusively limited to the first row of public seating* in the venue. Individuals who purchase the Platinum VIP Package will receive reserved and assigned front row tickets to both the Pageant Preliminaries and the Pageant Finals, as well as a complimentary program book and a complimentary Rehearsal Pass for Sunday morning. With the Platinum VIP Package, there is no need to arrive early - your seat(s) are reserved just for you. Platinum VIP Packages are available online, during contestant registration on Friday evening and Saturday morning, and following the Saturday morning briefing session if still available. Once the Platinum VIP Section row of seats is sold out, no more Platinum VIP seats will be available. * Please note that in some venues, the first row of seating may have to be held empty, so the first row of public seating may actually be the second row of seating in the venue. Children under the age of 5 are not required to have a ticket, provided the child sits in an adult's lap. If you prefer that a child under the age of 5 have their own seat, then it will be necessary to purchase a ticket. Tickets to events are not refundable and cannot be exchanged. For the safety of the contestants, photography and video recording of any type are strictly prohibited at the pageants. If you wish to purchase photos or videos of the pageant, professional photos and DVDs will be available for purchase onsite. Please note that the above image is not an exact representation of the venue and is not to scale.